Matteo Ragni, graduated in Architecture at the Politecnico di Milano. With Giulio Lacchetti in 2001 he was awarded with Compasso d’Oro ADI for the disposable biogradable spork “Moscardino”, which is now part of the permanent design collection at MOMA New York. In 2008 he founded TobeUs: brand of wooden toy cars handcrafted in Italy, a brand that wants to be a manifesto for consumer’s awareness. With TobeUs he regularly organizes workshops and exhibitions. 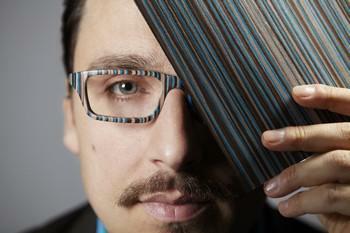 In 2012 he won the National Award for Innovation “Prize of Prizes” for the project W-eye. At the end of 2013 a celebratory exhibition about his work entitled “Matteo Ragni: Almost 20 Years of Design” was held at the “Italian Cultural Institute of Toronto”. Today, along with his activity of designer, he teaches, he works as an architect and an art director.